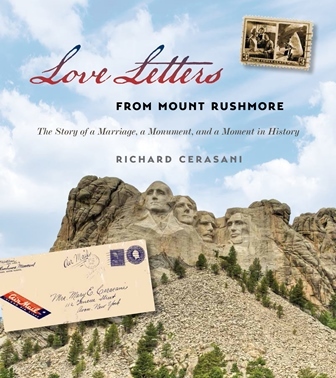 “Love Letters from Mount Rushmore: The Story of a Marriage, a Monument, and a Moment in History” by Richard Cerasani has won the Gold Award for Non-Fiction, Adult Books, from Mom’s Choice Awards®. Focusing on the story of Arthur Cerasani, a sculptor on the Mount Rushmore National Memorial from March to September of 1940, the book was published earlier this year by the South Dakota State Historical Society. An artist from Rochester, New York, Arthur Cerasani lived in the Black Hills, while his family remained over 1,500 miles away in Avon, N.Y. Over this vast distance, he and his wife Mary stayed connected through daily letters. Their correspondence, presented in “Love Letters from Mount Rushmore” with never-before-seen photographs, brings to light the everyday trials of working on the Mount Rushmore Memorial and the strength of the human spirit. Despite isolation, spring blizzards, summer heat, and the unpredictable moods and fortunes of master sculptor Gutzon Borglum, Arthur Cerasani managed to grow as an artist and connect with Luigi Del Bianco, Hugo Villa and other carvers of the great monument. The book’s author, Richard Cerasani, is the middle son of Arthur and Mary Cerasani. Using letters, photographs, art and personal memories, he shares the story of his parents and other workers on the national monument and puts them into the context of their time. A professional actor made famous by his role as the villain Bill Watson on “General Hospital,” Richard Cerasani has acted under the stage name Richard Caine for over 50 years. Mom’s Choice Awards® evaluates products from around the world created for children and families. Judges come from a variety of backgrounds and appraise a book’s quality, educational value, originality and appeal. “Love Letters from Mount Rushmore” is the first adult book from the SDSHS Press to receive an award from Mom’s Choice. In August, “Tasunka: A Lakota Horse Legend” received the Gold Award for Children’s Picture Books. “Love Letters from Mount Rushmore” is available in hardcover for $29.95 plus shipping and tax and can be purchased from most bookstores or ordered directly from the South Dakota Historical Society Press. Visit www.sdshspress.com, call (605) 773-6009 or email orders@sdshspress.com. Also you can order this book through the Heritage Store.